The Principality of Seborga is a micronation located in the northwestern Italian region of Liguria, near the French border, and in sight of Monaco at 43°50'43"N, 7°42'0"E. The principality is coexistent with, and claims the territory of an area of 15 km², the town of Seborga which is an Italian municipality. Unlike most micronations, Seborga possesses an undisputed history as a feudal state as Constitutional monarchy. It came into being in 954, when the Count of Ventimiglia ceded Seborga to the monks of Lerino, at the foundation of the Cistercian monastery there. In 1079 the Abbot of this monastery was made a Prince of the Holy Roman Empire, with temporal authority over the Principality of Seborga. On 20 January 1729, this independent principality was sold to the Savoy dynasty's Kingdom of Piedmont-Sardinia, then ruled by Victor Amadeus II. The argument for Seborga's present-day status as an independent state is founded on the claim that this sale was never registered by its new owner, resulting in the principality falling into a kind of legal twilight zone. Subsequently, in 1815, the Congress of Vienna overlooked Seborga in its redistribution of European territories after the Napoleonic Wars, and there is no mention of Seborga in the Act of Unification of Kingdom of Italy in 1861. In the early 1960s, Giorgio Carbone, then head of the local flower-growers co-operative, began promoting the idea that Seborga retained its historic independence as a principality. By 1963 the people of Seborga were sufficiently convinced of these arguments to elect Carbone as their "Head of State". He then assumed the title and style Giorgio I, Prince of Seborga, which he has held ever since. He was re-elected in 1993. 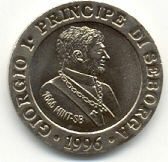 Carbone's status as "Prince" was confirmed on 23 April 1995, when, in an informal referendum, Seborgans voted 304 in favour, 4 against, for the Principality's constitution, and in favour of 'independence' from Italy. Even though the legality of that referendum may be questioned, the Luigino became Seborga's official currency the following day. Prince Giorgio is known locally as 'Sua Tremendità' ('Your Tremendousness' or 'Your Terrificness'). Moreover, there is no tension between the "Principality" of Seborga and the Italian government. Law enforcement, public health, telecommunications, school services and all other public services are provided as in the rest of Italy. Seborgans regularly pay taxes, participate in the Italian administrative life, and vote in local and national (Italian) elections. For instance, in the elections of the Senate in 2001 the voter turnout was 84.21%. He made a rare TV appearance in the 2005 BBC programme How to Start Your Own Country Episode 3 "For King and Country". In January 2006 Carbone announced that he would abdicate on reaching the age of 70, apparently as a result of a row over rebuilding the village centre, but he failed to follow through on his promise. Even so, this decision was the subject of a feature on the BBC World Service radio programme World Today on 25 January 2006. In June 2006 a power struggle arose when a woman calling herself "Princess Yasmine von Hohenstaufen Anjou Plantagenet", who claims to be the rightful heir to the throne of Seborga, wrote to Italy's president offering to return the principality to the state. The claim has since been proven frivolous and void. Principality of Seborga is a self-proclaimed independent state in the Liguria region of Italy. Motto: Sub Umbra Sedi (English: Sit in the Shade). Musical Anthem: La Speranza. Languages: Italian, Ligurian and French. He, Prince Giorgio I, presented evidence that Seborga was technically never part of Italy. Due to convoluted changes in ownership and bureaucratic oversights, it had not been listed as one of the states to be part of the Kingdom in the Unification of 1861, nor was this territory mentioned in regards to the formation of the Italian Republic in 1946. There was actually some historical precedent for coins within the Principality. 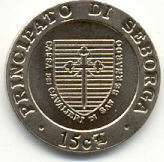 In 1666, abbots/monks founded Seborga's own mint (The mint of the Principality was founded on December 24, 1666 by Prince/Abbot Edward), which produced silver and gold Luiginos ("1666 MINT-SB" is indicated on the coins). The modern, “re-opened” mint currently offers replicas/reproductions of those XVII century coins, as well as the newer 1994-1996 coins (which reportedly still circulate locally). Cupro-nickel has a 20.5mm diameter causing the base of the letters of the surrounding inscription to rest upon its outer edge. Also sixth Grand Master of the Knights Templar. Also fourteenth Grand Master of the Knights Templar; commander of the Fifth Crusade. Vacant Period: 1219-1256. Also twentieth Grand Master of the Knights Templar. Also Regent of the Signory of Monaco to Honoré I from 22 August 1523 to 14 April 1532. Vacant period: 1532-1534. From Aug 1707, the sovereignty of Seborga is transferred from the Cistercian Abbot of Lérins to that of Bordighera. 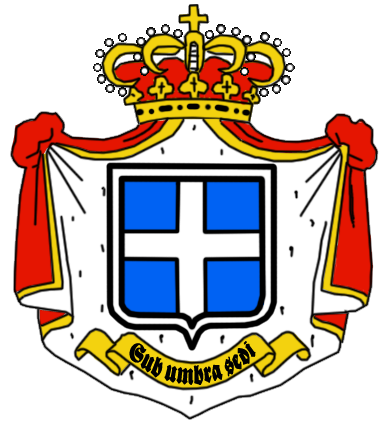 From 30 January 1729 Seborga becomes a Principality with the Patronage of the Kingdom of Sardinia. 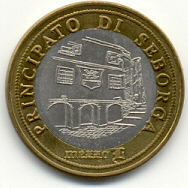 From 17 March 1861 Seborga becomes a Principality with the Patronage of the Kingdom of Italy. From 02 June 1946, Seborga is de facto annexed to the Italian Republic. He was made Prince for life on 24 September 1995. He was born on 14th Jun 1936 and died at the age of 73 on 25th Nov 2009. Marcello Menegatto was elected on April 25, 2010 and crowned on May 22, 2010. 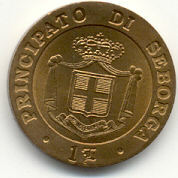 Thanks to Mr. George Cruikshank for the information pertaining to Seborga and it's coins. 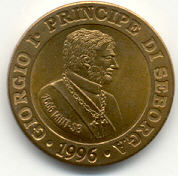 His website http://www.imperial-collection.net/seborga03.html is highly recommended as it has much information about the history, coins and their mintage from 1994 to 1996. Above coins are a brief description accordingly to him on Seborga' coins. Luigino is sub-divided in 100 centesimi Luigino. 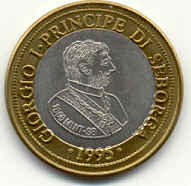 Confusion concerning the precise number of Seborga coin type has long persisted, thanks to claims on official Seborga website that the Prince authorised the reissue of Seborga currency for the first time on 23rd April 1995. What is not mentioned is the fact that a series of coins were minted in 1994 as a pre-released trial with a total of 50 sets. The set, which represents about half the Principality's entire numismatic output, comprised a 1 Luigino coin design, minted in each of twelve different metals (including, unusual, lead), inscribed on the obverse with the word PROVA (trial). A thirteenth 1 Luigino coin (SBC 002) was also minted in 1994 and this did not bear the PROVA inscription, which may include that it entered circulation at some point. Also minted were gold and platinum 100 Luigino patterns in a total mintage of 8 trial coin each, of which only three of each were released for sale. The luigino is accepted inside the city (along with the legal currency, the euro, and before that both Italian lira and French franc); it is recognized by the International Bank, but without legal value outside the town. Some claim that the Italian government did not welcome this initiative. It is not clear what is the total amount of luigini issued. 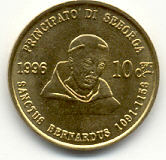 It is known that in the 1994-1996 period, Seborga minted twenty eight types of coins, including patterns. The base metal type could be exchanged for foreign currency at banks and commerical establishment inside the Principality and were in wide day-to-day circulation at the rate pegged to 6 US dollars = 1 Luigino, which the silver coins were probably intended for the numismatic collector market. 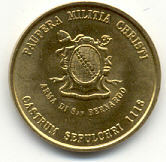 The current status of Seborga's coin remain unclear, while official website imply that Luigini remain a valid means of exchange within the Principality's borders, Seborga has not minted any further coins intended for circulation since 1996 and no longer appears to promote the ones produced before that year. Instead it has limited itself to the production of novelty facsimiles of several of its 17th century release. It has been suggested that this policy may be an outcome of Italian government pressure on Prince Giorgio to abandon the Luigino as an independent currency. Stamps are also issued. The stamps have only a philatelic value, since the only post office is the Italian one. The tourist office currently issues a Tourist Passport, which is basically a mere novelty and is not a recognized document valid for crossing international boundaries. Thanks to the publicity as a principality, tourism expanded. The principality's historic town centre was also restored, ensuring that its charms were protected from commercial overdevelopment. I purchased my 5,10 and 15 Centisimi from Joel Anderson. My Mezzo Luigino (50 centesimi) and 1 Luigino coins come from Alejandro Guelfand. He might still have a few of them and can be contact at (worldauctions2000@yahoo.com).